Aquatic veterinarians provide health care for marine species. Learn more about this career and discover if this is right for you. Aquatic veterinarians are practitioners that specialize in the health management of marine animals. Even in the traditional small animal practice, cases and patients vary daily, but for a traveling all-fish veterinarian, the variety increases exponentially. 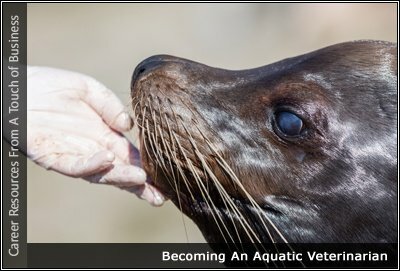 Read about the field of marine veterinary medicine, which involves caring for aquatic species such as those in zoos or marine parks. In a survey conducted by the Federal Bureau of Labor Statistics in May 2009, the mean annual salary for veterinarians of all types, including marine specialists, was listed as $90,110, equivalent to $43.32 per hour. The median salary for the occupation was $80,510.